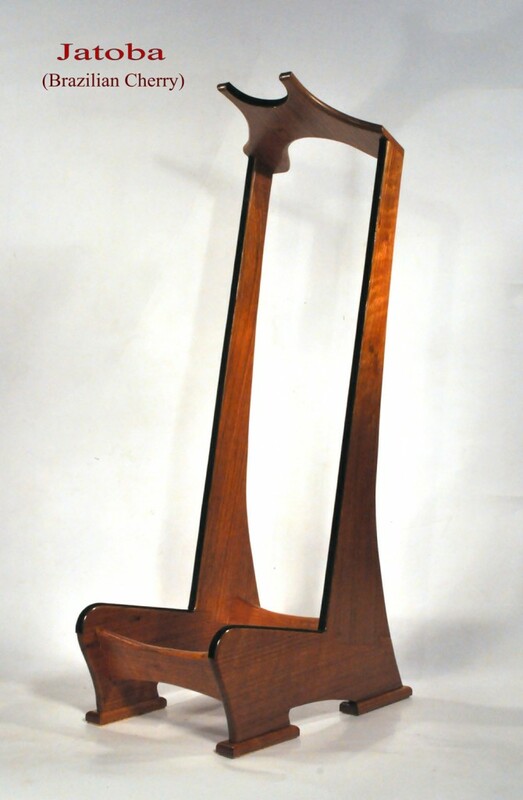 Why not have a beautifully hand crafted solid hardwood guitar stand to display your pride and joy in your home, office or studio? Lee Murdock has been building guitar stands for over 30 years when he has not been performing concerts across the country. 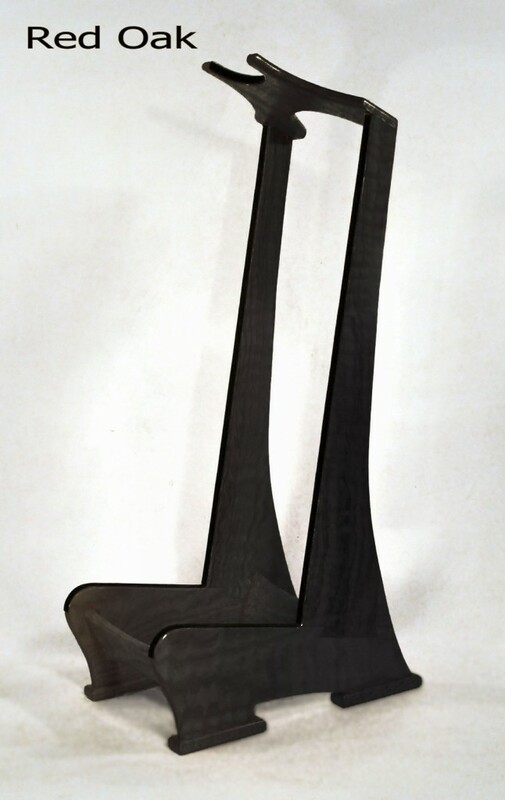 In that time, he has refined and honed his skills as a wood-worker, keeping close attention to fit and finish. Recently, Lee redesigned his studio stand to give it cleaner and more graceful lines, with features like dove-tail joinery, an homage to the guitar builders’ craft. He selects traditional furniture grade hardwoods such as oak, cherry, maple, mahogany, and walnut for stability and a timeless look. 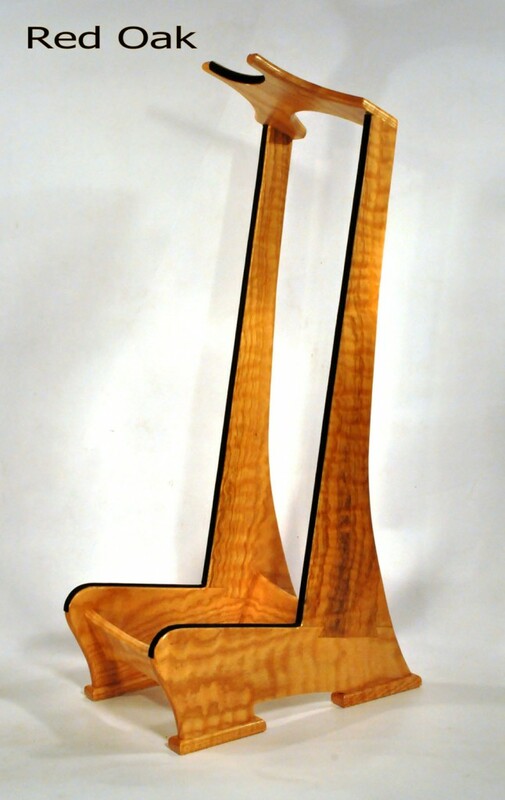 For just a few dollars more, he has made many of these guitar stands out of exotic and highly figured woods such as birds-eye and flame maple, quilted cherry, walnut burl, padauk, purpleheart, and maccassar ebony. Other species available are coco bolo, jatoba (Brazilian cherry), Hawaiian koa, lacewood, bloodwood, wenge, and zebra wood. 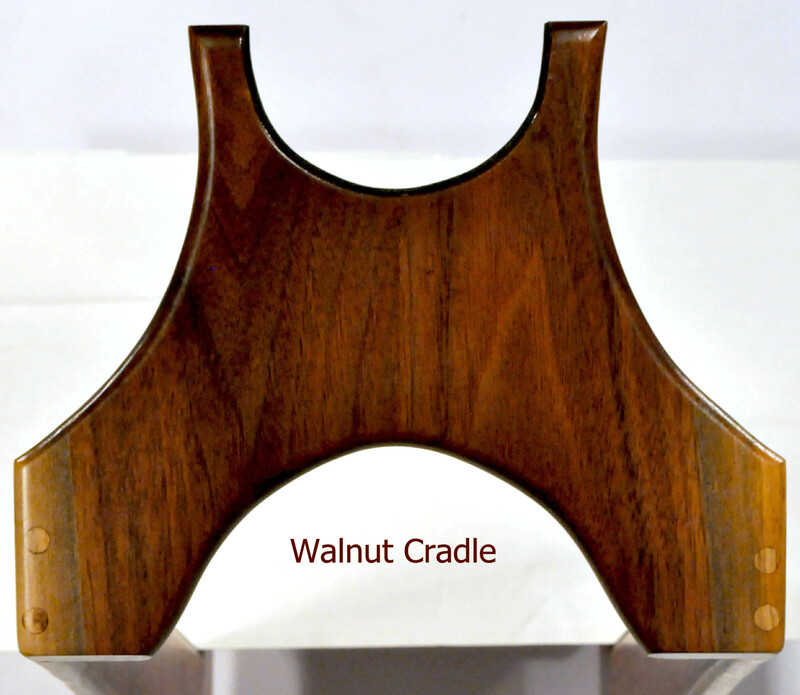 If you have spent your hard earned dollars on a once-in-a-lifetime acoustic, arch-top, or classical guitar, do you really want to display it on a tubular metal stand? 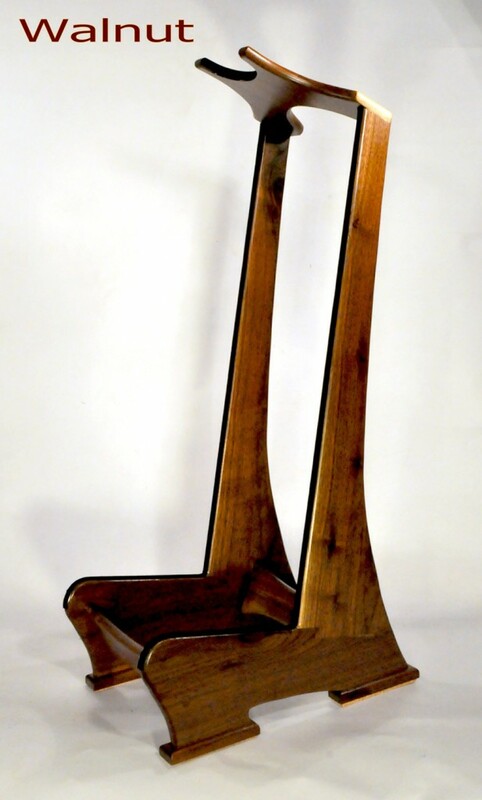 Let Lee make a guitar stand for you that is worthy of your instrument. Red oak, furniture grade hardwood. Price does not include shipping. We will contact you to arrange shipping at actual UPS rates (no markup) or to arrange free pick-up. Ebonized (stained) red oak or other furniture grade hardwood. Furniture grade hardwood, made from your choice of cherry or African mahogany. Choice Furniture grade hardwood, made from your choice of flame maple, quilted cherry, or figured walnut. These are more expensive woods, but breath-taking in beauty. Imported hardwoods, made from your choice of Purpleheart, Padauk, or Bloodwood. These imported woods are quite beautiful and uncommon since only a small amount is imported each year. Price does not include shipping. We will contact you to arrange shipping at actual UPS rates (no markup) or to arrange free pick-up. Contact us by email to jmurdock@artistsofnote.com to check availability. We may also have other specialty hardwoods available from time to time, and we have filled special orders in koa, macassar ebony, and bubinga. Contact us for pricing and custom order delivery time. Custom-made stands are also available in Cocobolo, Koa, Lacewood, Bloodwood, Wenge or Zebrawood. Please contact me for a quote, as the price and availability is subject to change.